Thank you for your interest in the machines that we have for sale. These machines were collected over the years. They were used in our displays throughout our showroom. 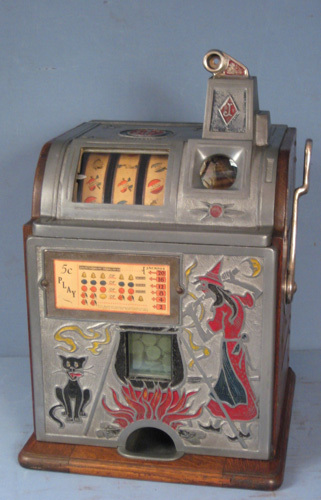 We, in no way are slot machine mechanics o experts on these older machines. We have not replaced parts/ nor done any tune-ups/etc. We can send you a separate cd of each machine that we have for sale. The Jennings Little Duke 1 cent #71-16788 was purchased from a guy in Pennsylvania who remembered it in his grandfathers store. In 2003/2004 we sent it to Slots of Montana who completely restored it, inside and out. Reel mech, strips, everything came out perfect.. we can send a cd of the extra pics. call 419-522-3777 or email.